Terms Specific to Market Data provided by Deutsche Borse AG (“Deutsche Borse AG”). “Unit of Count” means a billing unit. The onward dissemination of Real-time Information is permitted only within Closed User Groups unless exceptions from this general rule are expressly permitted for specific Deutsche Borse AG Market Data. The onward dissemination of Delayed Information is permitted within Open User Groups, as is any specific Real-time Information that is expressly identified to Client by Deutsche Borse AG or Vela as being so permitted. Client shall ensure that all access to Real-time Information is controlled and recorded by one of the following Units of Count: (1) Access IDs; (2) single quote; (3) Physical User ID; (4) any other Unit of Count agreed upon in writing by the parties. 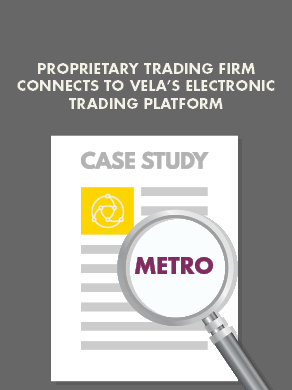 Client shall at least on a quarterly basis provide Honesty Statements to Vela confirming the number of Access IDs entitled for the individual Deutsche Borse AG Market Data products. If the entitlement of an Access ID commences or ceases during the period which is covered by the Honesty Statement (quarter or month) then the commencement or finish date shall be shown in the Honesty Statement and taken into account in the reporting. Client shall provide Vela with the Honesty Statements until the 15th day of the month following the end of a quarter. If preferential fees apply to Private Individuals, then Client shall have the right to issue a written or electronically submitted statement expressly confirming that he/she satisfies all of the criteria to be considered a Private Individual. As of 1 April 2008 Client of Vela may conduct Non-Display Information Usage of Real-time Information only if Client has in advance entered into a separate Agreement on the Non-Display Information Usage with Deutsche Borse AG and has complied with the requirements for a Non-Display Information Usage of Real-time Information set out therein.